16—18 April 2016 the team of the Donbass Dialogue Platform conducted the second dialogue marathon in the framework of “Dialogues with Steinar Bryn” program in Svyatogorsk. The marathon’s objective — the presentation of methodology and evaluation of effectiveness of online dialogue as a peacebuilding resource. analysis and evaluation of the methodology — on the third. Session 1: The peace process during the war. What are the limits, possibilities, practice? Session 2: How to organize a dialogue with community and local executive and legislative authorities? On the first day of the marathon the authors or co-authors of selected topics for the dialogues immersed the offline audience into problematics. They have been working together with the co-speakers, who were connected by online. The difference of the first marathon conducted in October, 2015 was that the offline audience worked on the topic in the group. Then the submitted result was presented to online by short presentation. This time we tried to connect both platforms of dialogue. The co-speakers participated in the immersion stage. Steinar Bryn joined us during first session from Lillehammer. The name of the co-speaker of the third section is not disclosed for reasons of security. The picture looked much more optimistic than on the first marathon. Firstly, the co-speakers don’t have the role of the opponents, but participated in the process of formation of unified semantic field. Secondly, the work of the co-speaker increases the concentration of the offline audience on the problem. The effect of the online is triggered: due to the limitations of the channels where information comes from, the dialogue requires more attention than the normal conversation. As a result there was a strong feeling of the group and speakers about its productivity and motivation to continue the conversation beyond the format. On the marathon the full number of participants was attended on the second day when the online dialogue sessions run. The experts monitor the process of communication of the online-dialoguers. 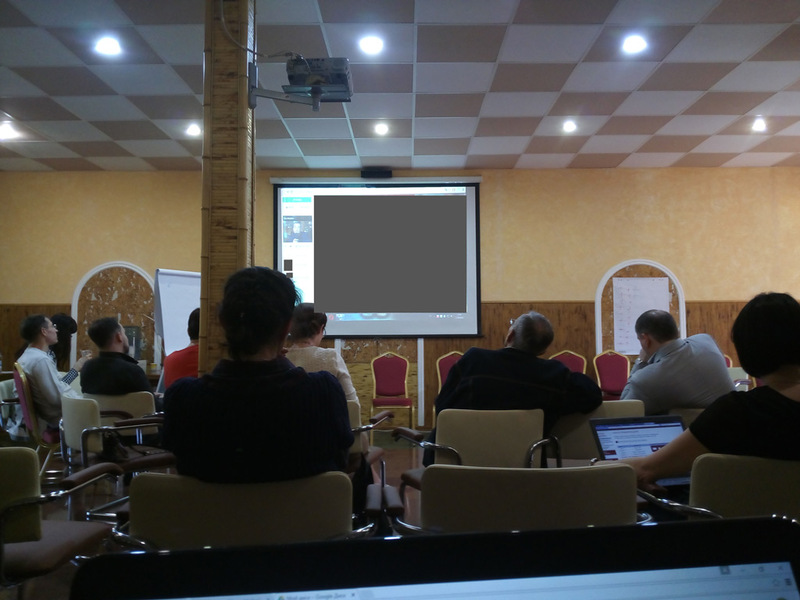 The projector transmits the image from the monitor of facilitator. Since the last marathon the procedure of the dialogue sessions remaines the same (donbassdialog.org.ua/p/dialogues-with-steinar-bryn.html). Except that four members not two have participated in the online part (three dialoguers and one facilitator). There were three dialogue online sessions, duration of which has been increased up to one and a half hours. All three online sessions were not similar to one another. 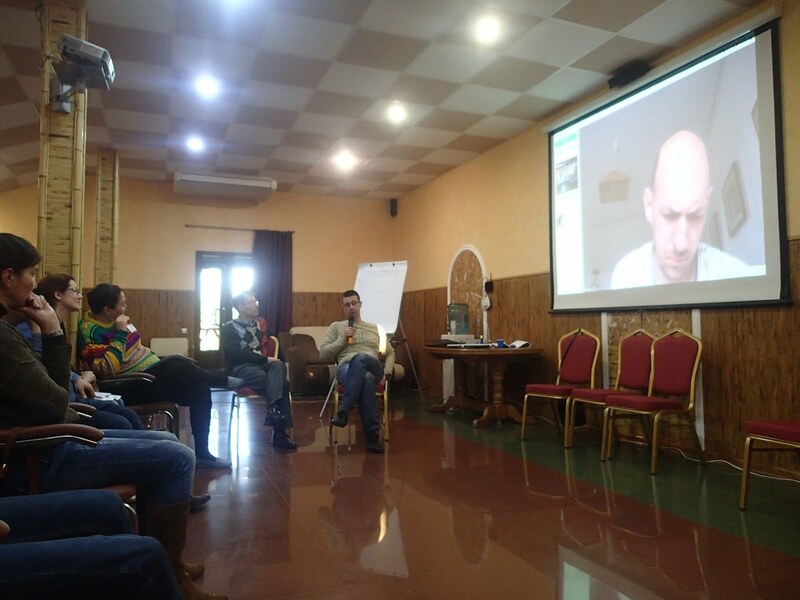 Session about communities and its relationship with the local authorities was so exciting that the participants have been continued for a while beyond the borders of the marathon (the method allows it). Session about violence was intense and promoting. The dialoguers reached concrete and real measures that would advance the solution of this system task. The session of the peace process during the war was the most supported by the Donbass Dialogue group. 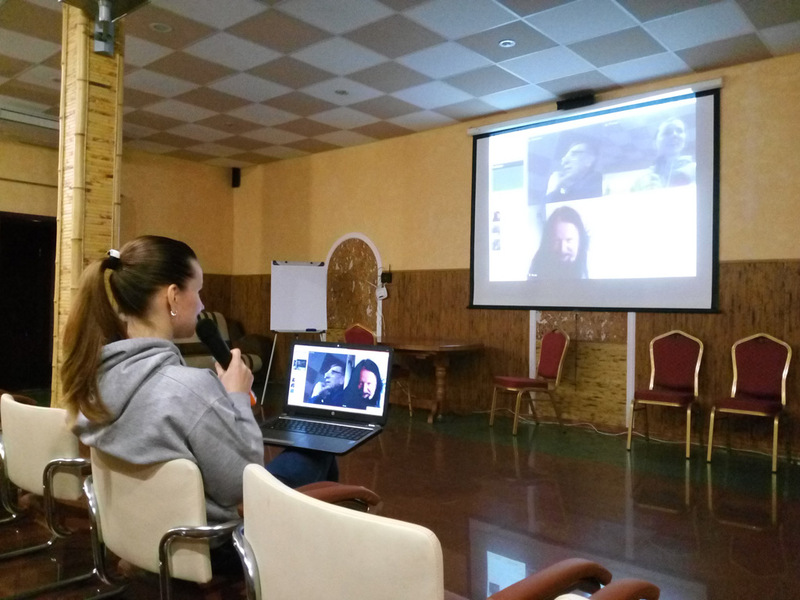 The professional facilitators were invited as the participants of online dialogue. Meanwhile this topic was difficult for them and they just listened the opponent who make it under conditions of real war. 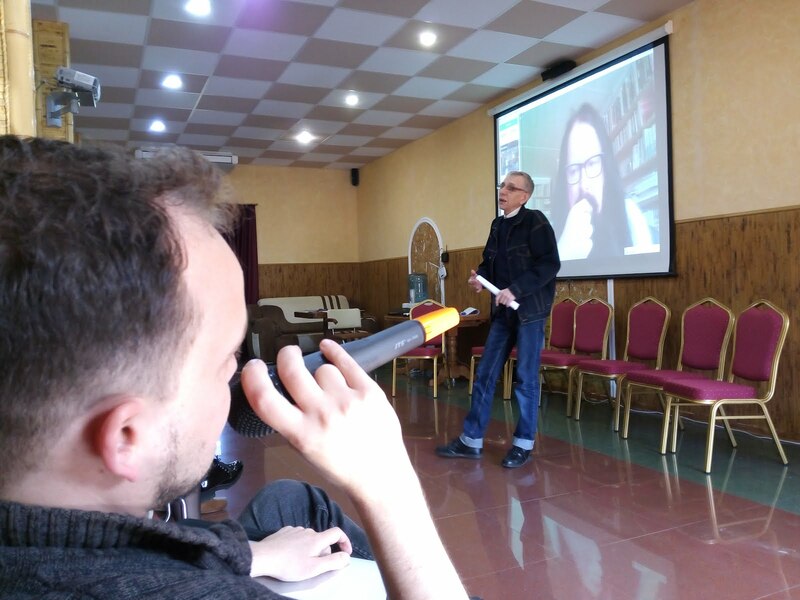 The third day was devoted to the analysis of the possibilities/limitations of the methodology and evaluation of opportunities of the project for the promotion of the online dialogues. As for the technique of facilitation of online dialogues, there were three different situations on the marathon where the facilitators had to work. And somehow all of them managed the task. Of course, since the online facilitation has some features the experience is needed. And the online dialogue is not a demonstrational technology. It is a confidential meeting. The best option is when the sides choose the facilitator themselves. It is optimal, but difficult to be implemented due to the innovativeness of the methodology. Therefore the offline platform could select the facilitators for some time as it was on the marathon. There is particular and complex issue — the preparation of online dialogues and the role of the offline platform. According to reviews of the marathon’s participants the most difficult is to understand how to build the crowdsourcing process. The specific problem is the facilitation of crowdsourcing. The question remains open, is it possible to practice the online dialogues out of supported platform? The level of reflection, the ability to indicate themselves of virtual and real are not developed tremendously with the global immersion of our society in the virtual network. The specific prejudices are formed that have actively been cultivated with the purpose of manipulating and control of the network environment (even formulation of such task gives a lot), which have to be overcome. However two dialogue marathons show the effectiveness of the online dialogues and the uniqueness of the methodology for the solution of specific problems in the work with conflict. We used WebRTC — an open-source project that intended to organize the streaming data between browsers or other applications that support the point-to-point technology as a technical platform for hosting the video connection of online- dialoguers. This method of organization of online dialogue enables the online participants to stay anonymous (no login required). As well the traffic between devices is almost impossible to intercept. Additionally the link to the video-stream of each session was generated randomly and shared to the participants for the purpose of security. During the preparation to the marathon, it turned out that six online participants together pulled up to 30 Mbit Internet. It complicates the process to loss of a contact. So it is necessary to develop the process by increasing number of sessions and therefore number of the offline platforms not through number of participants in the sessions. It took half a year of hard work of the Donbass Dialogue platform to be ready to this marathon. It required the conflict analysis in real-time, as well as support of the offline platforms with settings and upgrades to a dozen online and offline meetings, visits of the platform team through the separation line and across the country, support of a continuous discussion on key topics in the Facebook groups of the platform. It was not easy to launch such process but it came by virtue of three IDPs volunteers, who represent the team of the platform. It was possible to generate a process, where hundreds of people with interest and different views, sometimes with diametrically opposed positions were participated. It is hard to develop the online dialogue. It requires technical support, preliminary elaboration of the dialogue topics by crowdsourcing, maintenance that could take years. Exactly by this way the resolution of the bloody conflict goes. Through the dialogues, which lasted for years. The marathon was very eventful. It was important for the professional environment, local communities and potential donors of the project and, of course, for the project team. As practice shows, such intensity of events isn’t quickly visible in analytics, and leaves the event footprint which is not always obvious. Here there are the intricacy and the beauty of the dialogue. 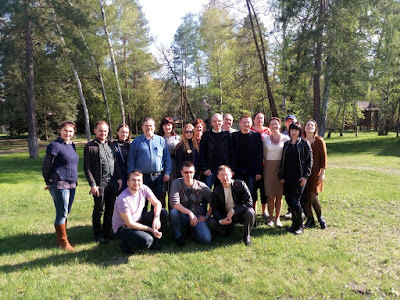 the online dialoguers group that represented the experience of Kiev, Donetsk, Dobropolie, Dnepropetrovsk, Lviv, Svyatogorsk, all team members during preparation of the marathon work with. The offline participants of the dialogue marathon. Special thanks to all online-dialoguers. They have demonstrated that neither borders, nor politicians, nor military actions are not barriers to human communication.